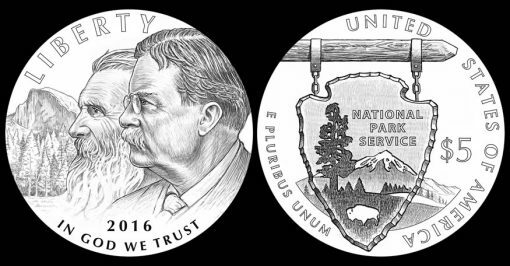 Designs for the 2016 National Park Service 100th Anniversary Commemorative Coins were unveiled Thursday, Nov. 19, during a ceremony at the U.S. Department of the Interior in Washington, DC. These United States Mint coins will be offered in gold, silver, and clad compositions, and they will be available in collector qualities of proof and uncirculated. Their launch in 2016 will feature designs emblematic of the centennial of the National Park Service (NPS). On hand for the ceremony were Treasurer of the United States Rosie Rios, National Park Foundation (NPF) President and Chief Executive Officer Will Shafroth, and NPS Director Jonathan B. Jarvis. "Heads or tails, this Centennial commemorative coin helps to honor the National Park Service’s first century of service to protect, preserve, and share some of our nation’s greatest natural resources, culture, and history," said Jarvis. Established in 1916, the NPS (www.nps.gov) is an agency of the Department of the Interior, and it is tasked with managing and safeguarding more than 400 national parks throughout the United States and its territories. Authorized by Public Law 113-291, the U.S. Mint in 2016 will strike and sell up to 100,000 $5 gold coins, 500,000 silver dollars and 750,000 clad half-dollars. Respective surcharges of $35, $10 and $5 are to be included in the price of each. "The coins will be a fun centennial collectible, and the proceeds will contribute to our second century of service to the American people," Jarvis added. The funds are to be used for projects that help preserve and protect resources under the stewardship of the NPS and promote public enjoyment and appreciation of these resources. They may not be used for land acquisitions. Coin prices, release dates and possible set options will be revealed at a later date. The $5 gold coin obverse (heads side) features John Muir and Theodore Roosevelt with Yosemite National Park’s Half Dome in the background. Inscriptions are LIBERTY, 2016, and IN GOD WE TRUST. United States Mint Sculptor-Engraver Don Everhart designed and sculpted it. The $5 gold coin reverse (tails side) features the NPS logo, with the inscriptions UNITED STATES OF AMERICA, E PLURIBUS UNUM, and $5. Everhart also designed and sculpted the reverse. 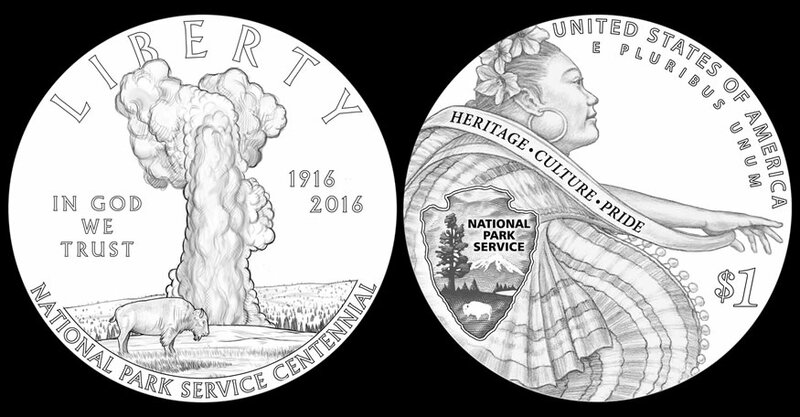 The silver dollar obverse features Yellowstone National Park’s Old Faithful geyser and a bison, with the inscriptions LIBERTY, NATIONAL PARK SERVICE CENTENNIAL, IN GOD WE TRUST, and 1916-2016. United States Mint Sculptor-Engraver Joseph Menna designed and sculpted it. The silver dollar reverse depicts a Latina Folklórico dancer and the NPS logo, representing the multi-faceted cultural experience found in America’s national parks. Inscriptions are UNITED STATES OF AMERICA, E PLURIBUS UNUM, $1, HERITAGE, CULTURE, and PRIDE. The reverse was designed by Artistic Infusion Program (AIP) artist Chris Costello and sculpted by United States Mint Sculptor-Engraver Jim Licaretz. 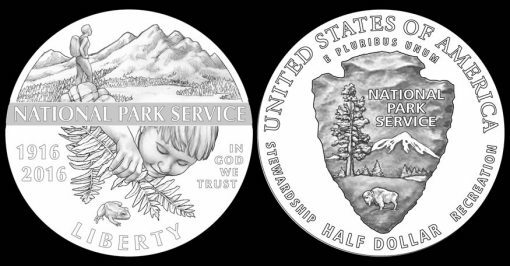 The clad half-dollar obverse features a hiker discovering the majesty of the wilderness and a small child discovering a frog hiding in ferns, which celebrates the diversity and breadth of the NPS. Inscriptions are LIBERTY, 2016, IN GOD WE TRUST, 1916, and NATIONAL PARK SERVICE. The obverse was designed by AIP artist Barbara Fox and will be sculpted by United States Mint Sculptor-Engraver Michael Gaudioso. The clad half-dollar reverse features the NPS logo, with the inscriptions UNITED STATES OF AMERICA, E PLURIBUS UNUM, HALF DOLLAR, STEWARDSHIP, and RECREATION. The reverse was designed by AIP artist Thomas Hipschen and sculpted by United States Mint Sculptor-Engraver Charles L. Vickers. If those are the final designs, I’ll pass. Old Faithful looks like a mushroom cloud. yes, and in real life it does too…you’re point Munzen? Generally I like them. I agree about the Latina folklore dancers prancing in the parks. Where does this happen? I guess I missed that. The Latina Folclorico dancer is a puzzle? To have the image of Latina dancer as a representation of multi-faceted cultural experience found in America’s national parks, on the same coin with old faithful and s buffalo doesn’t look properly designed. Am u missing some info? When will they learn to place the strongest designs in the dollar coin? Time for some new talent. There is a public unveiling of the 2016 Mark Twain commemorative coins on Saturday, Nov. 28. The U.S. Mint should have them available by the 27th. nowadays coin designs look like pins or stickers…..
How does one artistically, present something so vaporous onto something so solid ? This result, leaves one to the imagination. At least the Yellowstone ATB was more tenable. I’m with many so far, I’ve visited most national parks in my life time and I’ve never seen Latin Foik Dancers. I would have thought the United States Park Service could have used or made reference to our Native Americans on whose land some national parks share with them. Going west in 2016 and visiting some parks again, will keep my eyes open for those Dancers. Not really impressed with the designs, but being a Coin collector I’ll probably by the proof silver and clad. The obverse designs are pretty lame. Especially the dollar, since it was already done in 1999 with the Yellowstone National Park dollar. The US Mint hit it out of the park with Hall of Fame baseball coins in 2014, but this group of upcoming coins are three strikeouts. Wow! These are really bad. My money will be spent elsewhere. 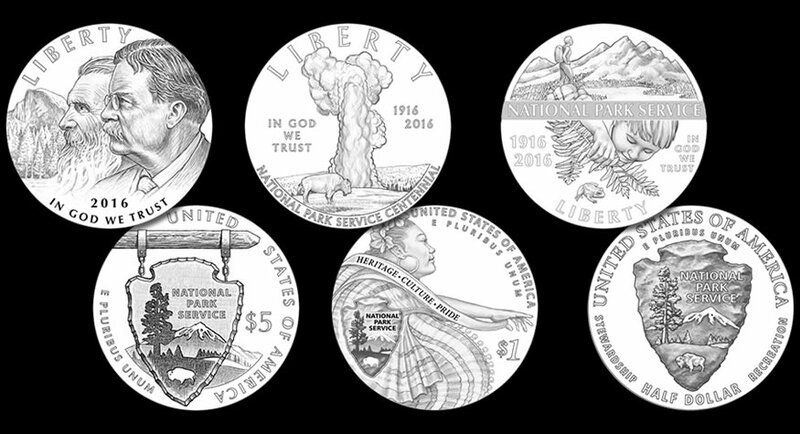 These are horrid designs but my love of national parks means I will probably buy the three coin set that will offer, I hope, the gold, silver proof, and proof clad. One never knows with the Mint, however, if the reasonable or normal action will be what it does. It is indescribably disappointing to wait for a coin only to see it will be a dog. I wonder how many national parks visitors, who do not normally buy coins, will buy these, making the mintage numbers (population) so high that the coins will be worth melt value only? I agree with most, the dollar design is horrible. They could have done so much….but didn’t. Was there any public input invited on this? I can’t imagine so. Very disappointing. On a positive note, it might be a good buy for collectors, as it doesn’t look like too many folks are buying it, given that it’s still available. I actually like the gold and the clad designs. I would totally have bought multiple silver dollars of either of those two. The 5$ gold will be too small, though, and I just have a thing about clads. Will probably buy one of each, and save money for a better designed coin next year. Sad, very sad. I wonder what the park service folks are saying about it?